I traveled around Bosnia for two weeks in 2016, visiting Trebinje, Mostar, and Sarajevo. 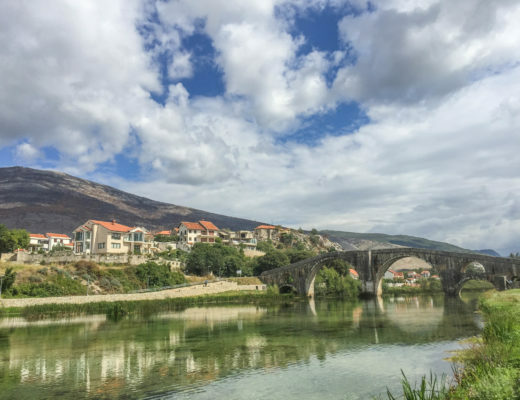 Each place left me floored with the natural beauty of the landscape, but as I began to write about Bosnia, I couldn’t shake my mind from what I had learned about the history from the locals, museums, and walking tours. 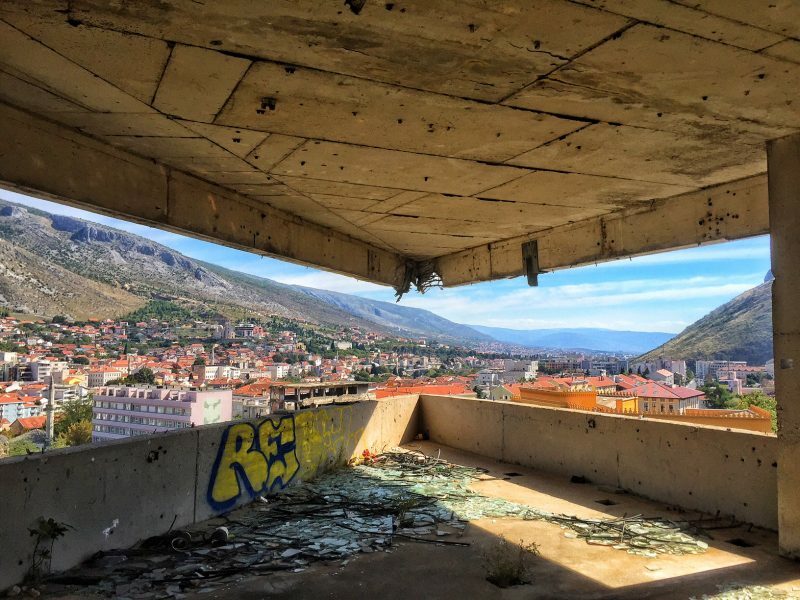 My posts about Mostar were emotional; about Sarajevo, they were focused on the decay of modern day urban ruins. But that’s a very one-sided view of Bosnia, and one that many Bosnians are trying to overcome. Understandably: the war was over 20 years ago, and Bosnia is in the middle of a well-deserved tourism boom. 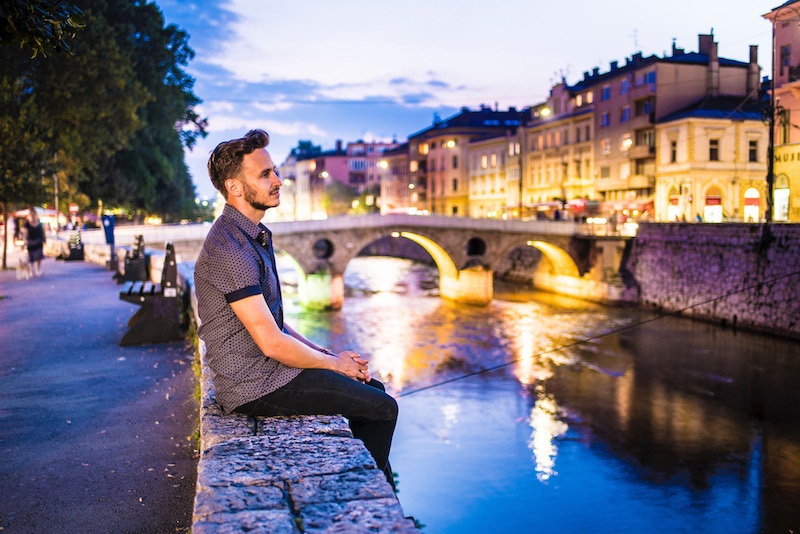 I was delighted when Robert of Leave Your Daily Hell reached out to me to ask if he could write a guest post on Bosnia, focusing on the beauty of this misunderstood Balkan country — and here’s his post below. When you hear the word “Bosnia,” it’s easy for your mind to go to dark places, from the Srebrenica massacre, to the decades the country spent behind the Iron Curtain, to most of the young country’s entries in the Eurovision song contest—it’s no surprise why it’s never won. Today, however, is all about Bosnia’s beauty. There’s a lot of it, more than you can probably imagine. 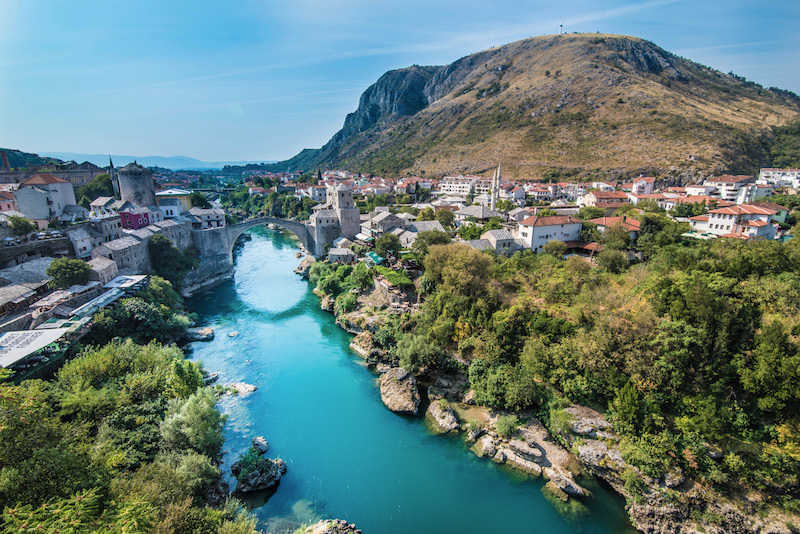 So whether you’re into mystical waterfalls careening through fairytale forests, charming historical towns, fragrant foods, or perfect panoramas, Bosnia possesses bountiful beauty. Here’s where to find it. The term “tourist trap” is usually used as a pejorative, but not in the city of Mostar—you’ll actually want to stay trapped here! 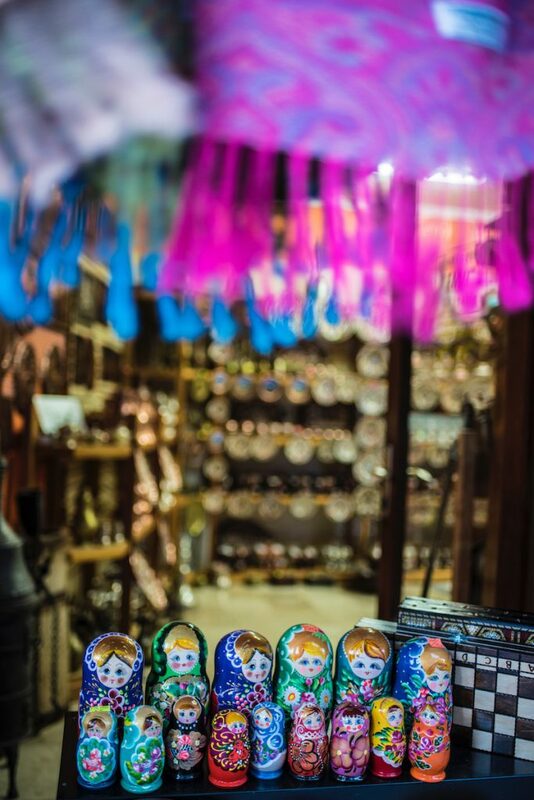 Indeed, Mostar is more accurately a tourist paradise, whether you look down onto the Neretva River from the minaret of one of its mosques, traipse along its ancient paths and over its old bridge, or take in Bosnian hospitality at a local guest house. Mostar’s current state is even more delightful when you consider that it was badly bombed during the Balkan War—truly, a phoenix risen from the ashes. The bad news about Kravice, a magnificent waterfall about two hours from Mostar in the verdant mountains of southern Bosnia, is that it’s almost impossible to get there without a car. The good news is that if you partake in the aforementioned Bosnian hospitality, your guest house owner will help you find an affordable, reliable one—and quickly to boot! 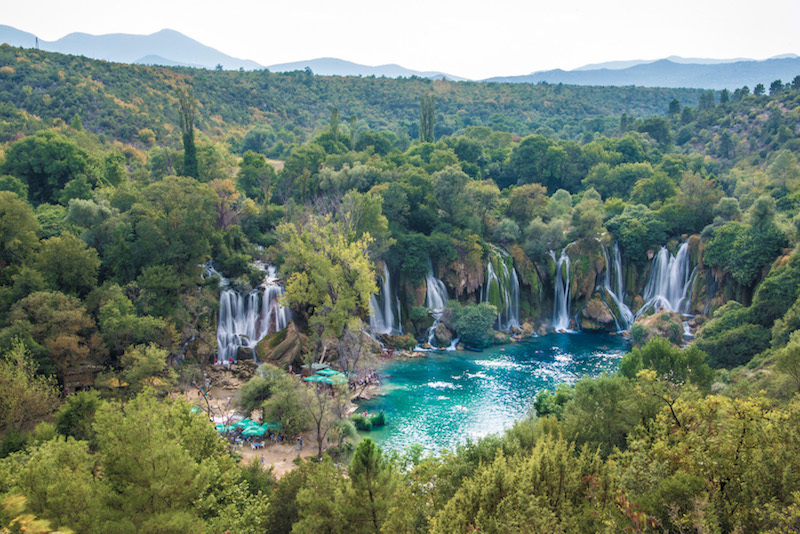 A day trip to Kravice is particularly refreshing during Bosnia’s impossibly hot summer. Mostar usually gets all the attention when it comes to Bosnia’s beauty contest, but Sarajevo’s Stari Grad (Old Town) is nothing to sneeze at. 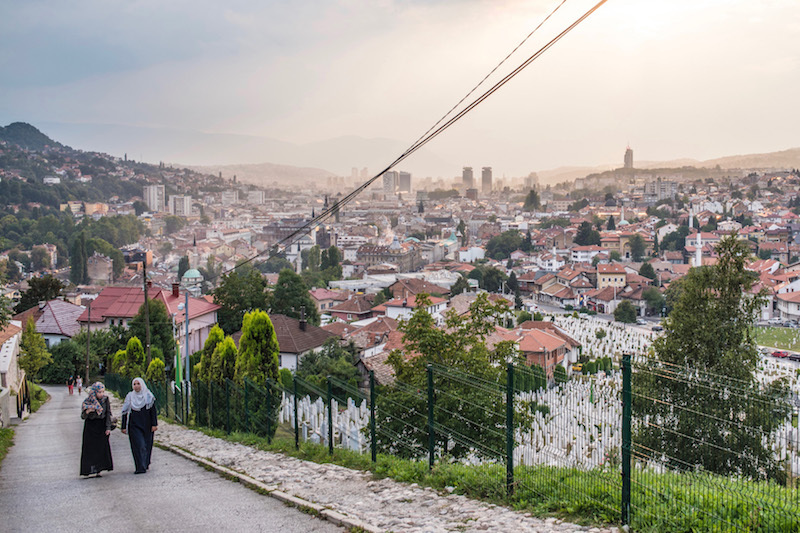 This picturesque district is full of mosques, shops, cobbled streets and delicious eateries like Pod Lipom, where you can try a “Sarajevo Sampler” full of Bosnia’s best local food (vegans beware! ), before walking over to the infamous Latin Bridge where Franz Ferdinand was shot. Sarajevo is a huge city, but it’s difficult to realize that within the confines of the Old Town. To get a true sense of its scope, you need to walk or take a taxi to Zuta Tabija, the so-called “Yellow Fortress” that overlooks the city. This is a particularly enjoyable experience at sunset, when orange and yellow light reflects off mosque towers and Avaz Twist Tower (the tallest building in the country) alike, illuminating the mix of new and old that underscores Sarajevo’s beauty. 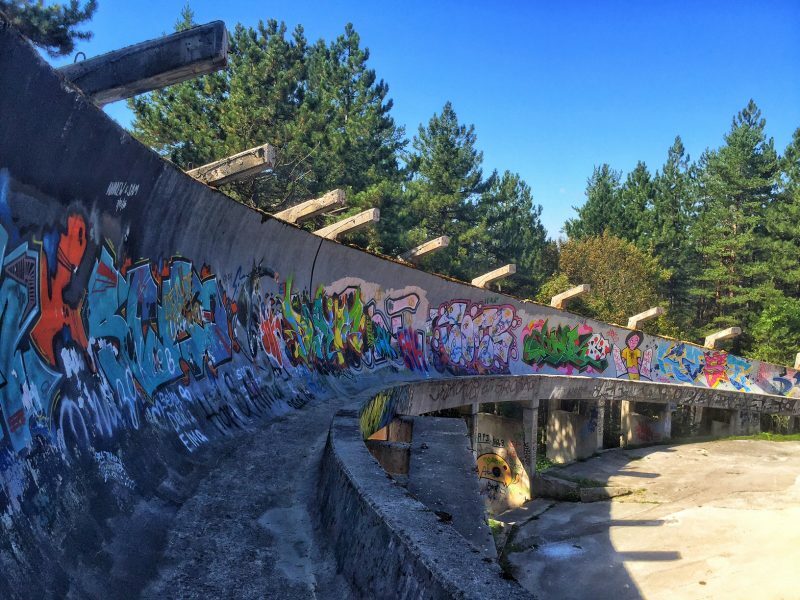 It’s difficult not to mention tragedy when writing about Bosnia, even when talking about beauty—so many sad chapters in the country’s history have beautiful conclusions. 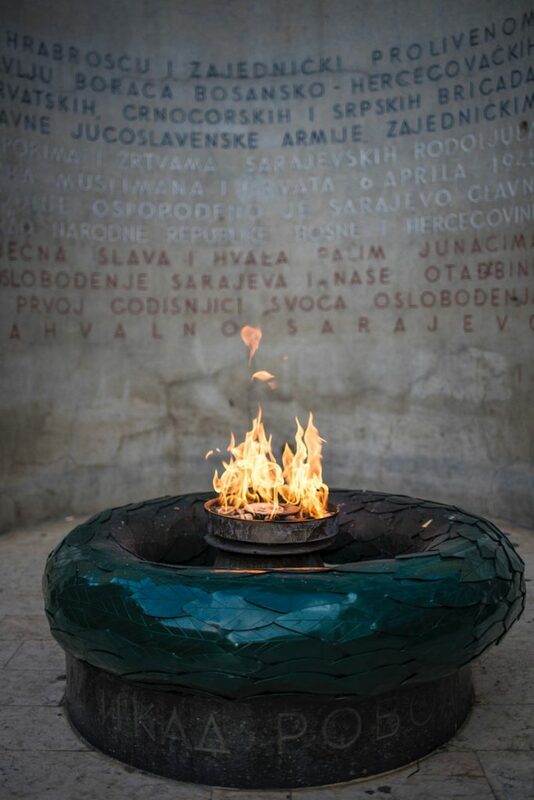 To be sure, there are few more emotional sights than the Eternal Flame that burns in the center of Sarajevo, ironically just steps from the best Srebrenica museum outside of Srebrenica itself. It’s a reminder that irrespective of political or humanitarians challenges, the Bosnian spirit will endure forever. And really, is there anything more beautiful than that? Robert Schrader is a writer, photographer, and creator of Leave Your Daily Hell, one of the world’s most popular independent travel blogs. When he’s not on the road, he lives in Bangkok, where he’s currently attempting to master the Thai language and not get fat—street food and self-control aren’t good bedfellows! 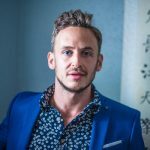 Read his blog or follow him on Instagram to keep up with his travels, which will take him to Iran at the end of this month. 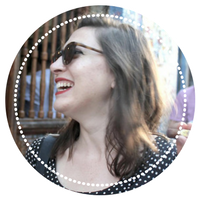 What a beautifully written and insightful post about Bosnia and Herzegovina. We travelled through this country earlier this year and we’re floored by its beauty. We are now looking for somewhere large enough for the 12 of us to enable us to explore it in more detail. It is such a lovely country, isn’t it? I hope you blog about your stay there once you return!